Journeys with 'The Waste Land' was a major exhibition exploring the significance of T.S. Eliot’s poem The Waste Land through the visual arts. In 1921, T.S. Eliot spent a few weeks in Margate at a crucial moment in his career. He arrived in a fragile state, physically and mentally, and worked on The Waste Land sitting in the Nayland Rock shelter on Margate Sands. The poem was published the following year, and proved to be a pivotal and influential modernist work, reflecting on the fractured world in the aftermath of the First World War as well as Eliot’s own personal crisis. 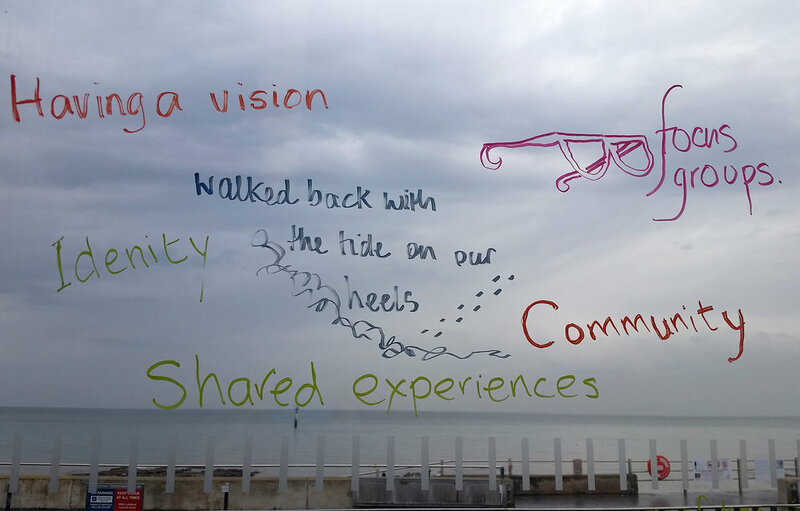 The research group worked together since 2015, and this project represents a new model for Turner Contemporary working together with local community. The group was open to anyone to join, and the make up of members evolved as time went on. They developed new ways of working together, sub groups, that met is different spaces, and tested different methods of looking at the text. For example debating in the library, performing it with a sound group in a gallery space, meeting in a pub, and of course in the shelter by the sea. They explored the whole town as part of the project. Every person that was involved with the project spoke about how much of a life changer it had been, to be part of this process. They had made new friends. One lady, Laura Shawyer said she had started off not wanting to read the poem at all, but had ended up reading it publicly to audiences. I thoroughly enjoyed the day, but I haven't been able to write a full account. So instead I have listed some of my notes, and quotes from the various speakers and the discussions. Trish Scott talking about the process, she worked together with the research group for 2 years leading up to the opening of the exhibition. A sign on the sea front.